We get quite a few repeated questions every month and for this outlook, I’ll dedicate it to answering some of the more popular ones. Q: Who are you guys? And how did I get in your list?? A: Yes, we’ve remained under the radar for quite a bit over the past year. With so many wine merchants mushrooming up, it is indeed hard to keep track of who is who, especially when we do not have a storefront nor do we have roots in the wine/F&B trade. WEA are simply wine lovers who want to share the wines we love with fellow wine lovers out there. And quite frankly, we prefer to let our wines do all the talking. If you are in our mailing list, that’s probably because you are a wine lover yourself. Q: So WEA, where are the expat leaving sales? A: Ummm… no, we are not Wine Exchange Asia. Any semblance is purely coincidental. Our focus is solely on Old World wines, with a specific focus on Burgundies, Champagnes and some Germans. If Aussies and Kiwis rock your boat, I highly recommend Wine Exchange Asia, our friendly neighbor at Extra Space Boon Keng. Q: How’s the provenance of your wines? A: Unlike other merchants, we do not see the point of harping continuously on the provenance of our wines. As wine merchants and wine lovers ourselves, good provenance is of second nature to us. Any wines which we do not manage to sell, has to go into our own collection, so naturally they have to be of provenance which meets our standard. Oh and for the record, corked wines doesn’t mean bad provenance. Q: Why are your quantities often so little? A: Firstly, we believe in quality over quantity. It is not easy to find large quantities of Burgundy at attractive prices. For Burgundy, especially, rarity is good. Also many of the Domaines we work direct with are also highly sought after and their wines have to be allocated out. Hence we are unable to fulfill large orders, especially of Grand Crus. That’s the nature of Burgundy and some grower Champagnes. Q: Who are those winemakers in your portfolio? Never heard of ’em. A: In the ’70s, Charles Rousseau had to personally peddle his wines in the UK market. In the ’80s, Henri Jayer was plentiful. As late as mid 2000s, before Philippe Engel passed on, the wines of Rene Engel can be had for a pittance. Many of our agency wineries are run by the new generation who has taken over the reins of their family Domaine. Based on our research and regular visits to Burgundy, we have identified those who have the potential to be the next Burgundian superstars. They are all young, spirited and have the determination to inject bold measures to rejuvenate the status quo. Actually that sounds exactly like our business model too. Exciting times ahead! What to look out for this month? We started off the month with a 2008 Henri Boillot Meursault 1er Perrières which was a bit disjointed at the moment. Couldn’t pick up much from it. Ending the month was a 2003 JJ Prüm Wehlener Sonnenuhr Auslese GK #9 which was amazingly well-balanced for this heatwave vintage. Acidity was not so high but the balance surprisingly worked out well. Simply unctuous and delicious! Prüms really need age. In between the two bottles, we had several themed dinners throughout the month. 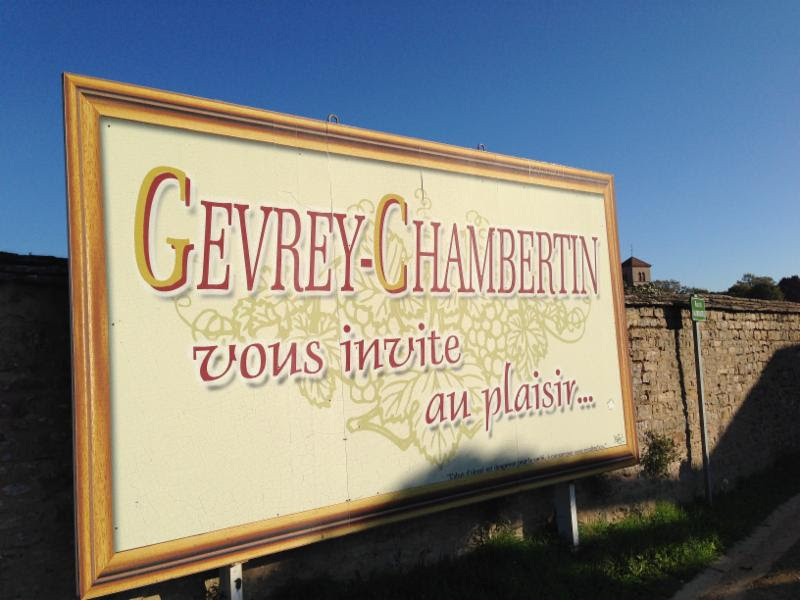 First was a Gevrey-Chambertin dinner at Burlamacco (free corkage on Tues!). A pair of Dugat-Py Coeur de Roy TVV started things off. The ’06 more expressive, riper with lovely aromatics yet dense with extract. The ’08 more acidic, reticent and structured. Next three big guns. 2008 Bachelet 1er Les Corbeaux was very balanced and pleasant if a bit tactiturn – I kinda liked it! 2009 Claude Dugat villages was stinky in the beginning but opened up with air. Very concentrated for a villages. 2009 Fourrier 1er Les Goulots was typical Fourrier. Elegant yet intense. Very balanced for this ripe vintage. Next up, 2012 Pascal Marchand 1er Fonteny which spoke of its cooler microclimate. Modern and slightly anonymous though. 2011 Duroché 1er Lavaut St. Jacques was very pure, elegant with a interesting aromatic nose. This followed through to the intense, juicy palate. This was a incredibly gorgeous and gulpable wine. Finally a Grand Cru to round things up – 1999 Vincent Girardin Clos de Beze. As with many ’99s, this was big, concentrated and very tight despite sitting in a decanter. One for the ages. Conclusion: Gevrey wines are easy to like. They are fairly fruit-dominated with hints of animale, leather, forest. No wonder many start their love for Burgundy via Gevrey! 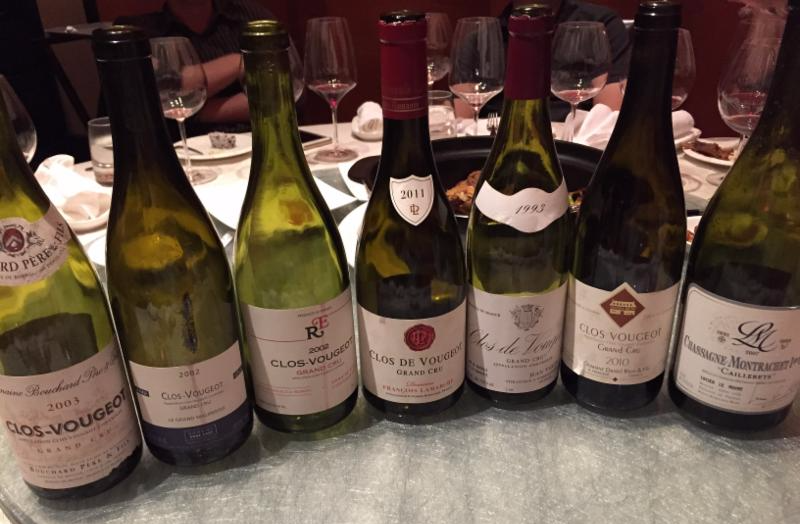 Next themed dinner was all about Clos Vougeot. But first the white, a 2007 Lucien Le Moine Chassagne-Montrachet 1er Les Caillerets. This was ripe, big, buttery and minerally. I guessed a Corton-Charlemagne from a ripe vintage. Apparently I was very wrong! On to the Clos Vougeots proper. 2003 Bouchard was very good for the vintage. One couldn’t tell the low acidity though palate-wise it was a tad anonymous. 1993 Jean Tardy tasted younger than it was. Many guessed early ’00s. The balance was still intact though it isn’t a showy wine. 2011 Lamarche was the surprise of the night and one of my favorite. It definitely outperformed the vintage as the structure and extract reminded me more of a 2010. One of the few 2011s which needs many more years. 2002 Rene Engel was next and what a treat. This was surprisingly more aged than I thought though. I guessed a ’93. This got better with more air and was the first to be emptied. Lovely juice. Interestingly another 2002 of the night from Anne Gros was totally different from it. Anne Gros was really fresh, pure and spicy which the Engel was more unruly, masculine. What a great comparison. Lastly 2010 Daniel Rion which showed the 2010 purity of fruit and structure well. Drinking quite well now. Conclusion: There are many different styles of Clos Vougeot but the common factor is austerity in the flavor profile. The tannins are not as harsh as Nuits St Georges but still can be unattractive for beginners. Also the style is quite variable so it is not easy to have a grasp of it. No wonder many do not appreciate this Grand Cru! To cap the month, a pretty amazing Echezeaux dinner. Before we began, some whites to start. 1999 Maison Leroy Meursault was everything an aged white Burg should be though it did seem a tad aged for a ’99. Golden. Honeyed on the nose and saline on the palate. Intense attack but rather short finish. 2004 Blain-Gagnard Criots-Bâtard-Montrachet was still rather young and was dominated by minerality rather than fruit. Finally, 2004 Bouchard Chevalier-Montrachet La Cabotte was absolutely stunning. A little oaky at the moment but no doubt will integrate over time. One sense so much potential here. And on to the stars of the night. The 2011 Jean-Marc Millot was underwhelming. Light, pure but lacks good intensity. Also a tad candyish and anonymous. 2005 Perdrix was tannic and a beast. Quite enjoyable in the beginning but later on the tannins overwhelmed it. 2004 and 2009 Jayer-Gilles couldn’t be more different. The ’04 was one of the rare ones which wasn’t green at all on the nose but perhaps a little bit herbal on the palate. I guessed 2001 though. Very nice and drinking nicely now without being prematurely aged. The ’09 had some mint and big ripe fruits. Not showing too much at the moment but will definitely emerge into something great. 2008 Anne Gros was as usual pretty, aromatic, spicy and drinking nicely. Light-handed and feminine in style. A crowd pleaser. 2004 Meo-Camuzet meanwhile was surprisingly robust and tight for the vintage. Some green pepper on the nose which was mildly distracting. One of the few ’04s which needs more aging. This was one of the 2 favorite wines of the night. Next up, 2007 Bizot. Blinded, I preferred this over the 2007 d’Eugenie which was big and brooding for the vintage. Very concentrated and a tad extracted. Most preferred this over the Bizot which was more elegant and light and true to the vintage. A 1999 Grivot was brimming with dry extract but so shut down. Austere but impressive. Finally, a 2006 Mongeard-Mugneret VV which had the most Vosne-like nose amongst all the wines and the most identifiable as a Echezeaux. Beautiful red fruits and spice dominates the nose which the palate was sappy and pure. Not oaky at all. This was the other wine of the night. Conclusion: Some Echezeaux shares more similarity with Clos Vougeot while others with the other Grand Crus of Vosne-Romanee. The wines are structured and robust. Not as austere as Clos Vougeot. Not all show Grand Cru presence but when they do, it is clearly justified as a Grand Cru. This entry was posted in Outlook on June 1, 2015 by WEA Wines. For us at WEA Wines, we don’t see the purpose of Bordeaux EPs at this point in time when the fine wines market is saturated with plenty of older clarets. If you are looking for some aged Bordeaux for drinking or further cellaring, drop us an email. We will gladly suggest a list of wines which you do not need to wait 2 years to collect (and 10 years to drink) and are priced as competitive as any of the recent EPs. On our side, we will also ensure the pristine fine wine bottles are not marred by any superfluous adhesives. The 2010 Brunello EP which ended recently, is another thing altogether. Many of the wines are well-priced and it is really a great vintage for Sangiovese in Tuscany. We rarely sell Brunellos so this is a totally independent view. We do not profess to be specialists in Brunellos so I would gladly encourage you to procure some from other merchants who might be offering them. On our end, we stick to what we do best. Our first batch of 2013 Burgundy EP are scheduled to be shipped later this month and will arrive in early June, making them one of the first 2013 Burgundies to reach our shores. The past week has also been all about Germans. From reds to sweet Rieslings to dry Grosses Gewächs (including the revered G-Max). Most are sold out already so we will go back to Burgundies for the rest of the month. Exciting times ahead! Burgundy’s Grande Dame, Madame Anne-Claude Leflaive has passed away on 6th April at age 59. She is survived by her husband, and three daughters. Together with Madame Lalou-Bize Leroy, she was a strong proponent of the biodynamic way of winemaking since the early ’90s. Under her direction, Domaine Leflaive has gone from strength to strength and is arguably one of the top, if not the top Domaine for white Burgundies. I am fortunate to have been able to taste a wide range of their wines from the Bourgogne Blanc to the Chevalier-Montrachet (except for their unicorn Le Montrachet which is in my bucket list), and the wines are singular in their purity and expression of terroir. I attended a lunch several years ago where Madame Leflaive was supposed to be in attendance but unfortunately she was ill and could not attend. Nevertheless the wines that day showed extremely well and provided a benchmark for which I will always judge white Burgundies by. I know what I will be drinking this weekend. We hosted our first wine tasting of the year early in March. Great to see both old and new faces! The tasting started with NV Cheurlin Coeur de Famille (Blanc de Noir) which was clean, lightly red-fruited with tremendous minerality. Also that was the first time we showcased the R&V Bérêche Côte Premier Cru (Blanc de Blanc from base year of 2007 and disgorged June ’14), and the salinity and power was obvious. I can see the Selosse influence. 2012 Mongeard-Mugneret Fixin was rather unyielding and truly showed its deep robust potential the day after. 2012 Gerard Mugneret Vosne-Romanee was dark and very serious, like the man himself. 2012 Duroche Gevrey-Chambertin 1er Champeaux was the crowd-pleaser for the day with seductive plummy notes and ultra-refined tannins. 2012 Heresztyn-Mazzini Gevrey-Chambertin 1er Goulots had noticeable stem influence in its elegant and pure flavors. The Morey-St-Denis 1er Millandes from the same producer and vintage was riper and more robust and arguably the one most like Clos de la Roche. Lastly, the 2008 Jean-Marc Bouley Pommard 1er Rugiens showed why Rugiens is a candidate for an upgrade to Grand Cru status. I’ve had it several times, and each time it showed a different aspect. This time it was more restrained and serious. On another occasion, 2006 DRC Grands-Echezeaux was regal, with show-stopping presence yet so calm and poised. 2008 Bruno Clair Gevrey-Chambertin 1er Clos St. Jacques was beautifully spicy, precise and balanced for this high acid vintage. 2004 Dom Pérignon was fairly approachable now with its nutty, toasty character. NV Cheurlin Noëllat Brut Rosé was just bursting with raspberries but so easy to drink and almost gulp-able. It has a tinge of sweetness for those not a fan of extra brut bottlings. 2005 Michelot Meursault 1er Perrières was a producer I’ve not heard before and unfortunately it was a little anonymous for this esteemed vineyard. 1988 Pavelot Savigny-lès-Beaune 1er Aux Guettes was surprisingly youthful for a Savigny. Do not underestimate this village as many great wines came from there. 2000 Font de Michelle Châteauneuf-du-Pape was quite bretty and barnyardy. Probably needs more air to open up. 2012 Fourrier Bourgogne Blanc tasted more like a Riesling than Chardonnay with Hints of petrol and ripe peaches. 2011 Heymann-Löwenstein Winninger Uhlen Reserve “R” Roth Lay (what a mouthful) was understated but the finish lingers with extreme minerality. 1996 Michel Noëllat Echezeaux was a little odd, much too advanced for the Grand Cru and vintage. 2003 Joseph Roty Gevrey-Chambertin Les Champs-Chenys showed well with its tell-tale low acidity of the vintage but clearly the pedigree was there – from the refined tannins to the admirable length. One of our wine dinners in March was the portfolio tasting of the 2012 reds of Domaine Mongeard-Mugneret at Restaurant Absinthe. We started with the 2011 Bourgogne Hautes Côtes de Nuits Le Prieuré (blanc) as an aperitif. More mineral than fruit, this was crisp, dry and very refreshing. The dinner started proper with a pair of Vosne-Romanee 1er Les Orveaux and Nuits St. Georges 1er Les Boudots. The former was quintessential Vosne, spicy but light for the vintage, betraying its higher altitude roots. Boudots as usual was more concentrated, darker fruits and more unyielding. The next flight raised the standard further. Echezeaux and Clos Vougeot side by side where the extra complexity was evident from the first whiff. Echezeaux was qualitative similar to the Orveaux in terms of Vosne spice while Clos Vougeot was more similar to the Boudots with its weight and concentration. Orveaux and Echezeaux can be enjoyed now while the Boudots and Clos Vougeot are candidates for long-term aging. The last flight was the Grands-Echezeaux which was absolutely stunning in its breadth and width. Very very classy and refined. To cap things off was the ever-dependable 2005 Rieussec. Already slightly evolved, this had toffee, caramel and dried citrus flavors – ending with a refreshing bittersweet note on the finish. A great dinner and everyone had a great evening. This entry was posted in Outlook on April 11, 2015 by WEA Wines. WEA were pleasantly surprised to be alerted that all three of the Domaines featured on the cover of this month’s Winart – Japan’s influential fine wine magazine – are carried by us. In particular, Domaine Jean-Marc Bouley and Domaine Marc Roy are our exclusive agencies in Singapore. The three Domaines including Domaine Lamy, have been identified as Rising Stars in Burgundy, but for my palate, they are already making exemplary wines. The only unfortunate thing holding them back is that they lack a top Grand Cru plot in their holdings to escalate them into the upper echelons of Burgundy. No matter, this keeps their price in check and provides great value for drinkers like me. We have some older vintages of Bouley in stock, so don’t hesitate to check our wine list on the website. Many of the wines we are carrying are new to the Singapore market but make no mistake, they are already well-established in the European market or picking up acclaims amongst the critics. We have almost reached the one third point of our 2013 Burgundy En Primeur campaign and in the following months we have more exciting Domaines to offer. Again, just to emphasize that EP offers allows you to buy the wines at the lowest possible price before the wines are bottled. Our previous offers of 2013s are still available for Laurent Roumier, Meuneveaux, Jean-Marc Bouley and Marc Roy. So if you have not made your orders, or have not seen the offers, please email me. Exciting times ahead! Next in our wine dinner series, we will feature the 2012s of Domaine Mongeard-Mugneret. Mark your calendars for 25th March for we will serve an excellent range of wines from the Domaine, mainly 1er Crus and Grand Crus. We still have a few seat left for the dinner at Restaurant Absinthe, so let me know if you are keen to join us. Some wines tasted which I missed out last month. A pairing of the 1996 and 2005 Philipponnat Clos des Goisses was an interesting contrast. The 1996 tasted fresher (though with a tad more acidity than I’d have preferred) with more verve than the rounder, richer 2005. 2002 Dom Pérignon was more quiet and elegant compared to the flashier Clos des Goisses. Very tight and one for aging. The highlight of the Champagnes was undoubtedly the 2010 Cédric Bouchard La Presle (Blanc de Noir), the first vintage produced from this vineyard. Cool fruit rather than tropical. Fine and classy with a monumental presence. Befuddled how a Champagne can taste so vinous. A comparison between 1999 Carillon Puligny-Montrachet and 2004 Carillon Puligny-Montrachet 1er Les Referts was enlightening. Undoubtedly the 1999 was the stronger vintage as the villages wine was drinking beautifully now albeit with limited depth and finish to speak of while the 2004 showed a superb nose with kaleidoscopic flavors, a nod to its 1er Cru origins. Bravo! The last white was the 2008 Raveneau Chablis 1er Vaillons which was flinty, mineral and with the richness characteristic of the Domaine yet with great acidity in check though this bottle seems to be a little aged for a 2008. The reds started with 1983 Remoissenet Gevrey-Chambertin 1er Clos St. Jacques which could be from the current Sylvie Esmonin plot. Unfortunately it was a little tired now and should be drunk up. 1994 Castello di Ama Vigna l’Apparita ended the dinner. 100% Merlot but tasted quite new-world. Well-made but I did not feel it spoke of the terroir. Just 2 bottles of wine actually tasted this month. First the 2011 Georges Noellat Nuits St. Georges 1er Les Boudots made by wonder boy Maxime Cheurlin. Slighty oaky when first opened but slowly integrated with air. Lots of spice on the nose as well as crunchy red fruits. Mineral and savory on the palate with earth and grass. Flavor profile is Vosne but structure and tannins are Nuits. And finally 1996 Chandon de Briailles Corton-Bressandes which wasn’t completely secondary yet. The 1996 acidity was still obvious though with sufficient fruit and extract to integrate with more time. A quintessential elegant Bresandes. This entry was posted in Outlook on March 15, 2015 by WEA Wines. Sorry for this rather late outlook as February is shaping up to be a pretty busy month as we try to clear up our backlog of work before Chinese New Year. 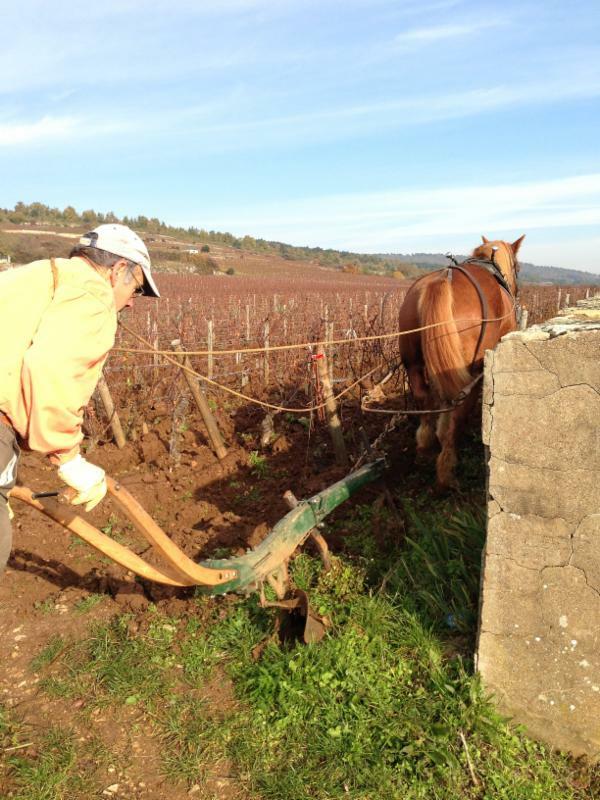 It is also an anniversary of sorts here as it was exactly one year ago in February 2014 that we refreshed our business to focus more on Burgundies. How time flies and we believe in the past one year we have done our bit to shake up the wine scene here and to bring many lovely wines to your cellar and of course, dining table. – Stephen Tanzer, Vinous Media. Frankly speaking there are no longer “bad” vintages like in the ’90s and earlier. There is only stylistically different vintages. Some are structured for the long haul, some are ripe and fleshy, and some are perfectly pure and transparent. Good producers have always made good wines across vintages – even more so now with technological advancement and a will to produce quality wines without too much financial constraints. Such is the golden era for Burgundy. Exciting times ahead! Feb is a pretty short month with Chinese New Year taking stage, along with another round of drinking and feasting. Our first wine tasting of the year will take place in early March following the arrival of a new batch of wines in late Feb.
March will also see another of our wine dinner series, this time featuring the 2012s of Domaine Mongeard-Mugneret. I get the feeling that many have a less than stellar impression of this Domaine, no doubt accentuated by the fire sales from the previous local distributor. This dinner will give you a chance to reacquaint with the excellent wines of the Domaine which are improving tremendously in recent vintages. January was another bumper month for us. We started with a mini portfolio tasting at Asia Grand. Food was kinda average but the wines really shone. NV Cheurlin Noëllat Coeur de Famille was laced liberally with salty minerality beneath the red-fruited core. I have to say this is one for the wine geek. 2009 Dönnhoff Hermannshöhle GG feels a tad overripe in the beginning but slowly balanced out with air. This wine needs many more years. 2011 Hubert Lamy St-Aubin 1er Clos de la Chatenierewas fairly rich and concentrated for a St Aubin – many guessed Meursault. 2012 Duroche Gevrey Les Jeunes Rois was all about pretty florals and sweet fruits. So far I’ve not met anyone who has not been charmed by their wines. 2012 Mongeard-Mugneret Vosne 1er Orveaux was very transparent for this ripe vintage. I would have guessed a 2010! 2012 Gérard Mugneret Vosne 1er Brulees was riper, denser and altogether more serious – a mysterious lady in black. 2008 Jean-Marc Bouley Pommard 1er Rugiens ended the evening with people guessing Vosne as there is refinement here in spades. This wine just changes my misconception about Rugiens and no doubt Thomas is crafting some amazing wines here. A lazy Saturday afternoon at a friend’s place brought out several wines, all blinded. 2003 JJ Prüm Wehlener Sonnenuhr Spätlese was very easy to drink and despite the lower acidity, was very gulpable. 2003 Maison Leroy Bourgogne was amazingly young and didn’t come across as over-ripe though there is a certain anonymity to it. 1995 Camus-Bruchon Savigny 1er Narbantons was unfortunately a little evolved so drink up now. 2003 Gérard Mugneret Vosne-Romanée was the clear standout of the day. It is not easy to find the wines from recent vintages, not to mention one made by Gérard before he passed the baton to his son. Dinner with some new Instagram friends at Jade Palace with 1999 Pol Roger Sir Winston Churchilland NV De Sousa Réserve 2012. Former was intense and the pedigree of a great vintage is obvious while the latter was more round with some age. Antoine Jobard Meursault-Blagny 1er was clean, precise – more Puligny than Meursault. This is possibly my favourite Jobard cuvee so far. 2005 Taupenot-Merme MSD 1er La Riotte was quite structured, pure and balanced. 2000 Hudelot-Noellat Vosne 1er Malconsorts was more meaty, animale with menthol notes. More savory than pretty. 1992 Burguet Gilles Gevrey 1er Lavaux St. Jacques was surprisingly still vibrant despite the tertiary profile.2008 Thibault Liger-Belair Chambolle 1er Gruenchers had me guessing Vosne, despite my second time having it. 2012 Denis Mortet Bourgogne Blanc was quite a rare sighting and really fresh and delicious for its level. One to keep an eye on. 2011 Coche-Dury Pommard Vaumuriens was typical Coche. Pure and focused. Still tightly coiled and will need years to unfold despite being an ‘early-drinking’ vintage. Such a treat. We had a 2011 L’if at Restaurant Ember (very reasonable corkage and excellent service). The wine was very concentrated for a 2011 with sweet plums and silky tannins. Drinking beautifully with minimal aeration. Ending the month, a simple get-together with 1999 Hospices de Beaune Pommard Cuvée Suzanne Chaudronwhich was surprisingly peaking for the vintage. The first 1999 I had that actually wasn’t tight anymore. The 2005 Faiveley Mercurey La Framboisière was fresher with high-toned raspberries befitting the name. 2004 Château Marojallia meanwhile came up to be untypically ripe for the vintage. This entry was posted in Outlook on February 16, 2015 by WEA Wines. 2015 is finally upon us and we are kicking off the New Year with our first Fine Wines Outlook for the year. I hope many of you guys drank some good wines over the past month. I know I sure did. For the new year, WEA have dusted off the cobwebs from our official website and the cleaner interface should make browsing through it much easier on the eye. Also, more information on the agency wines we carry are available there. So if you want to know what the critics say about Antoine Jobard etc., just go to the page and all the summaries and reviews are aggregated on the respective pages. We will be constantly updating the pages with fresh info so do check it out from time to time. As many have requested as well, we have posted our Price List online for your consideration. Do note that the bulk of our offers still come via the Mailing List so do keep a look out. For Burgundy fans, you will be pleased to know that many of the professional critics’ reviews of the 2013 vintage has been released. For paid subscriptions, Neal Martin from Wine Advocate and Bill Nanson from Burgundy Report have both released their reports while John Gilman from View from the Cellar will release his over the next few days. For those who do not want to shell out moolah, you will be pleased to know you still can read some free reviews online from Claude Kolm of The Fine Wine Review and from Steen Öhman of Winehog. And of course we are wrapping up our remaining 2012 offers and then we can start with the ’13s from many more new names. Exciting times ahead! As we have mentioned before, we are planning more events in 2015 and the first one to set the bar is the launch of our new agency wine from Domaine Jean-Marc Bouley. Based in Volnay, the Domaine makes a suite of Volnays, a Beaune 1er and their flagship Pommard 1er Crus. Thomas Bouley, the 4th generation of the family, has taken over gradually from his father Jean-Marc since 2006 and the quality level has leapfrogged tremendously. For those who think that Pommards are austere and rustic, you owe it to yourself to see how Thomas has crafted a set of extremely refined wines. We will release further details this coming Tuesday. Very few seats to offer out so drop us a note if you would like to be informed in advance of a night of great food and fine wines. Date: 20 January 2015 (Tuesday), 7pm. Location: Restaurant Nicolas, 10 Teck Lim Road. The celebratory month started with NV Cheurlin Noëllat Carte d’Or Brut, our housepour Champagne. Round and intense with a slightly off-dry profile – a great drink to start things off. Next up, a dinner at Jade Palace (where else?) which promised to rule them all and it did! Two gorgeous Rieslings matched perfectly with Cantonese appetizers but the similarities ended there. 2012 Keller von der Fels was a little off-balanced at the moment with the acidity poking out but there was plenty of extract for this humble cuvee from Keller. 2004 Robert Weil Kiedricher Gräfenberg Spätlese looked and tasted like it had barely aged at all. The sweetness however, has mellowed down and what’s left is a lovely richness balanced perfectly with bright acidity. I had seconds and thirds of this. A 2012 Denis Bachelet Gevrey-Chambertin VV sneaked in with opaque color and a deep dark fruited nose. Very concentrated and some oak started to poke out, this probably needs many years to integrate. Things started getting serious when a blinded 2000 Drouhin Musigny appeared. Very restrained and primary, this surpassed the reputation of the vintage and shows that great producers triumph over ‘weaker’ vintages. A 2003 Vogüé Bonnes Mares reared its head with dark and ripe fruits and this is one ’03 which showed the rather stewy side of the vintage but with air it kinda improved a little. 2006 Dujac Vosne-Romanée 1er Aux Malconsorts meanwhile was all pretty florals and red fruited aromas. Such a feminine and lovely wine chez Dujac. An intermezzo with 2012 Antoine Jobard Meursault 1er Les Poruzots which had people guessing Chevalier-Montrachet (! ), was very showy and flamboyant yet balanced well with bright acidity. A class of its own. Next a 2007 Bouchard Corton-Charlemagne surpassed the general quality of the vintage. It was bright, rich and intense with saline minerality – everything a Corton-Charlie should be. One of the last wines of the night before the Northern Rhone monsters took over was the 2010 Lucien Le Moine Clos de Bèze. Extremely dense and full-bodied, it did not show a certain transparency of the vintage. I would re-visit this in 5 more years. Christmas Eve was a lovely bottle of 2007 Comte Liger-Belair Vosne-Romanée La Colombiere which was drinking beautifully now but did not seem to reach the heights of a 1er Cru as the price would suggest. Last bottles of the year was at the humble Extra Space Tasting Room where the 2011 Gérard Mugneret Vosne-Romanée showed beautifully. Red fruited with hints of spice and without the herbalness some ’11s display. Extremely more-ish. 2010 Roumier Chambolle-Musigny showed a different facade to Burgundy. For a villages wine it was very dark and dense. A robust rather than airy Chambolle. 2010 Duroché Latricières-Chambertin shocked everyone who guessed a Chambolle. A gorgeous wine, it was pure and elegant. This further confirmed to me that Duroché makes the most feminine Gevreys around. This entry was posted in Outlook on January 5, 2015 by WEA Wines.